To see if you like the course, you can test one lesson week’s content of each level for free. Ich heiße Juliane. I am a polyglot and travel enthusiast from Berlin. I’ve always loved to learn new languages and while I was doing my degree in Modern Foreign Languages and living abroad (France, UK, Brazil, Canada), I also discovered my passion for teaching German as a foreign language. With all these experiences combined, I felt the need for a different approach to teaching German and therefore to create my own materials. I spent over ten years developing a complete course from scratch, constantly adapting it to the needs of my students as they progressed. 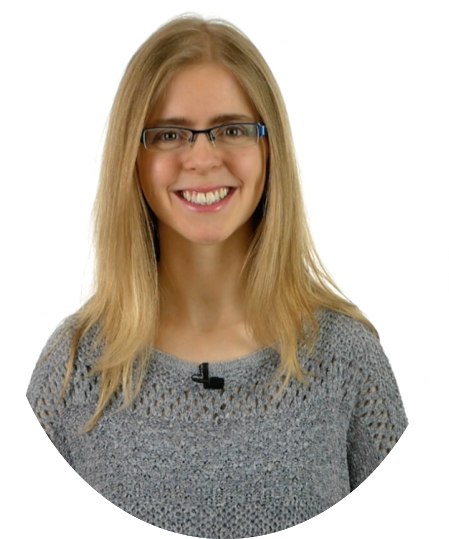 When the demand for my one-on-one classes completely exceeded my capacities, I decided to make my work available to a broader audience by turning it into a comprehensive, well-structured and easy-to-follow online video course. And this is how www.germantogo.com was born! How is your video course different from other video courses? No other German video course on the internet is as well structured and versatile as this one. Even if you are a complete beginner, you will be able to follow without getting lost. Each lesson of my course builds up on the previous lessons, in terms of grammar and in terms of vocabulary used. In the beginners' stage, you will never be exposed to overly complicated and unnecessary words and sentences. We will constantly review the concepts seen earlier and do many, many exercises until you are able to do them in your sleep. Other video courses only contain grammar explanations and you are a passive listener. Here, it's not just a mere series of disconnected grammar or vocabulary videos. You get to participate and SPEAK yourself. We will do exercises together and slowly, step by step, increase your level of German. Is there any support as I go through the course? As a tutor, I am very committed to answering all the questions my students might have. You can always send me emails and there is a question and comment section at the bottom of each lesson page. So whatever your doubts, I will make sure you have them clarified quickly so that you can move on with the lessons. Does the course follow the European Framework for Languages (A1, A2, B1, B2, C1, C2)? The course roughly follows the European Framework for Languages. However, the priority of topics varies a bit: For example, in textbooks, the adjective declension and sentences with "weil" (because) and "dass" (that) are usually taught a bit later in the curriculum. I consider them to be very fundamental and useful, so I teach them very soon in the course. Nervertheless, the levels A1, A2... are indicated as a reference and for exam preparation. Each Level on Germantogo.com actually covers more than what the European Framework for Languages specifies. Is the course suitable for complete beginners? Yes, the course is absolutely suitable for complete beginners. I developed the curriculum when I was taking my one-on-one students from speaking no German at all to speaking it fluently. The whole course progresses naturally and logically, with clear explanations and many exercises to practice. Is the course suitable for advanced learners? During my one-on-one classes, I have always had students from intermediate levels B1, B2, or even more advanced, who had a lot of gaps concerning very fundamental grammar. They managed to express themselves well, to say everything they wanted to say, but they kept making a lot of mistakes. Either they learned the language on their own and skipped important rules, or they attended a course in which the teacher moved forward too fast and didn't leave the students enough time to really internalise basics like the declensions, the past tense, word order etc. In my one-on-one classes, the material was always tailored to my students' personal needs and with many advanced learners, I actually went though A1 topics to start filling these gaps. So, if this sounds familiar to you, then yes, the course is also for you! I just want to learn a bit of German for my next trip to Germany. Is the course suitable for me? If you want to be able to make your own sentences and be able to express most things you want to say on your trip, then yes, the course is for you. The first part of the course covers everything you need to know to reach a good, basic German - including asking questions, giving and understanding directions, reserving a room, understanding a German menu and so many more things. It corresponds to level A1 of the common European framework and covers the most important parts of grammar you will ever need in the German language. However, there is work involved. It is not one of these courses which teach you sentences to say in different situations and that you should learn by heart. In that type of courses, you might be able to quickly pick up some phrases that will be useful on your trip, but they won't give you the power of creating your own sentences and you probably won't understand what people answer back. Your subscription includes full and immediate access to everything available on the website, 550+ videos (over 80 hours of content), pdf and audio files in the video course (currently "A1 - beginner", "A2 - elementary" and part of "B1 - intermediate"). You will also be able to see everything inside "Comprehension": "Short texts" with vocabulary lists, downloadable audio files and worksheets as well as a special pronunciation training. 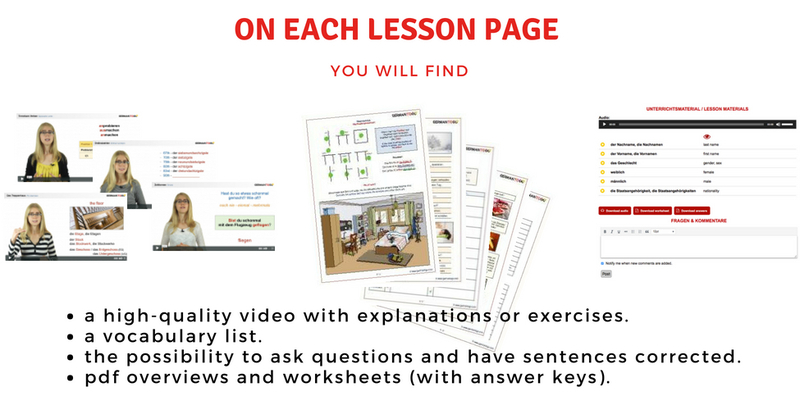 You can watch all "Short videos" (commented street scenes) and in "short stories", you will also see a vocabulary list and downloadable worksheets and audio files. There is also a big section full of authentic texts recorded by native speakers. You can contact me directly for any needs and questions you might have. New materials will be added monthly. 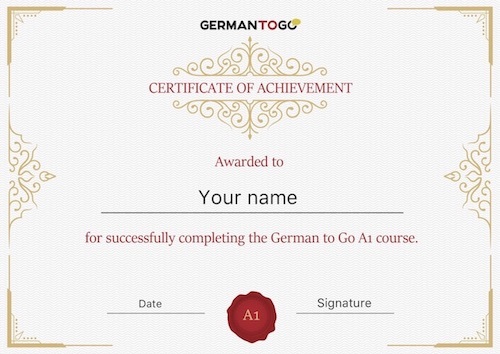 The "beginner" part of the course will lead you from zero German to being able to complete the language exam for level A1. With the "advanced beginner" part, you will be comfortable with the A2 exam as well. The materials for level B1 will be finished by June 2019. You will have access to all materials that will be published during the time of your subscription. What is the video course like? The course is a video version of the one-on-one lessons I have been developing and teaching in the last 10 years. It's a mix of clear grammar explanations, many interactive exercises, role plays, cultural topics as well as texts and German music. For all materials, you will find a downloadable worksheet and audio file to be able to learn in places where you don't have access to the internet or for when you just don't want to be sitting in front of a screen. The course is made up of video lessons, but you are not supposed to watch them passively. You need to play an active part by saying the answers to my questions out aloud so that you can get used to actually SPEAKING German. There will be enough time for you to formulate your answers before I give you my correct version. You will actually SEE me in each video. I tried to design the course for you to have an experience that is as close to having a one-on-one tutor as possible. And you can always ask me your questions. How much time will it take to go through the course? It will depend on how much time you can invest to do the course. The "step view" is designed in a way that you can complete one level in less than 6 months by doing only 15 minutes of German on six days of the week. This is the minimum time investment I recommend. It is more important to study a bit, but on a regular basis, than learning for two hours once a week. You will see all the membership plans available by clicking on “Pricing". Is there a free trial or money back guarantee? Yes, there is a money back guarantee. For the 3 months plan it is 10 days, for the 6 months membership it is 2 weeks and for the annual membership it is 1 month. If the course is not for you, just send me a message in time at info@germantogo.com and tell me why would like to have a refund. Of course I cannot give a refund if I see that you have already consumed too much the course or downloaded too many of the pdf and audio files. I am a teacher. Can I use your materials with my students? Yes, under certain conditions. Please take a look at his page: https://www.germantogo.com/i-am-a-teacher/ or send me a message to discuss the details. Thank you! I have more questions. Where can I ask them? Every day is a new chance to do what you want to do.